Laoconnection.com: ຖາມຫຍັງກໍໄດ້ - An Authority? Question: Who are you? How are you an authority on this subject? Answer: These are actual questions that someone asked back in 2013 here on this blog in the comments section of a post. You can probably find it still there. Keep in mind that the blog post was about general background info about this blog. It was not on any particular topic or discussion. I still remember reading this person's post and laughing out loud but then also wondering why they seemed so offended by our blog. To be frank, I felt that their question had an air of condescension and rudeness. In spite of that, I responded with humour. And it's a story I very much enjoy sharing with people. I share it as an example of what type of communication that people send in and the occasional lack of courtesy that occurs. But more than anything I share it because it's just funny. An authority? I don’t think we claim that. Though that makes a great nickname, “The Authority” I like it! All kidding aside, to address your question: Indeed we know quite a bit on the topic of Laos and Lao culture but certainly do not claim to be an “authority” on it. If you follow us on this site, you’ll know that a lot is covered and when there’s a mistake made and a correction needed we will openly admit it and make the change. We also say that we too are constantly learning new things about Lao related topics. Ultimately, our hope is that people enjoy and learn from what is shared on here. So we’ll let our website and posts speak for themselves. Whether our visitors perceive us to be an authority is really up to our visitors but we do not claim to be as such. The Authority...wait, we mean Laoconnection.com Team! For those wanting to add to the conversation, your comments below the posts are welcome. 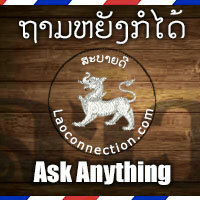 Feel free to make contact in Facebook to ask questions.